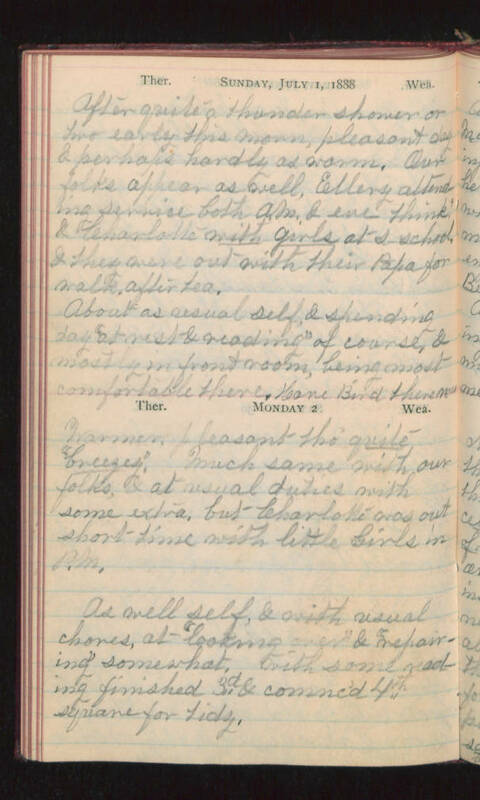 Sunday, July 1, 1888 After quite a thunder shower or two early this morn, pleasant day & perhaps hardly as warm. Our folks appear as well, Elllery attending service both A.M. & eve think? & Charlotte with girls at s-school, & they were out with their Papa for walk after tea. About as usual self, & spending day "at rest & reading" of course, & mostly in front room, being most comfortable there. Have bird there now. Monday 2 Warmer, pleasant tho' quite "breezey". Much same with our folks, & at usual duties with some extra, but Charlotte was out short time with little Girls in P.M. As well self, & with usual chores, at "looking over" & "repairing" somewhat, with some reading finished 3d & commc'd 4th square for Lidy.